In the beginning (nearly 2,000 years ago), consumption of chocolate drinks and the like were reserved for special occasions. Its labeling as an aphrodisiac increased chocolate’s popularity. For some time, the elite enjoyed the benefits of the cocoa bean, while others used it as currency. Chocolate was a true luxury – some believed it even had mythical powers. In 1861, Cadbury Brothers released the first heart-shaped box of chocolates and marketed it for Valentine’s Day. This sparked the commercialization of the holiday and it’s association with chocolate. 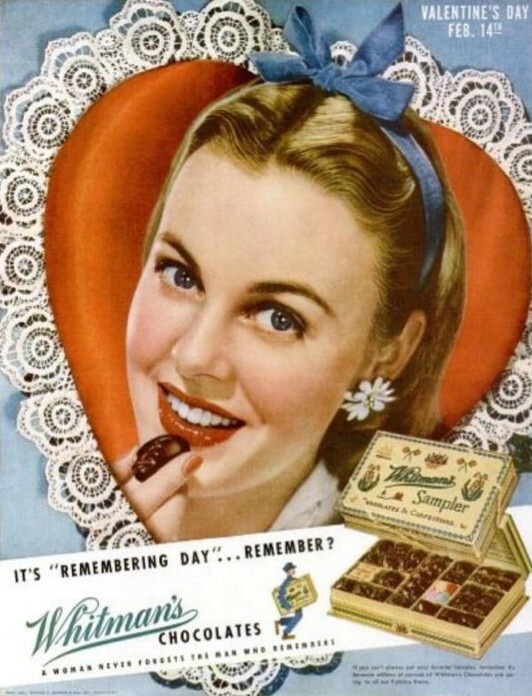 By the 1900s chocolate was a top gift for loved ones across the globe. 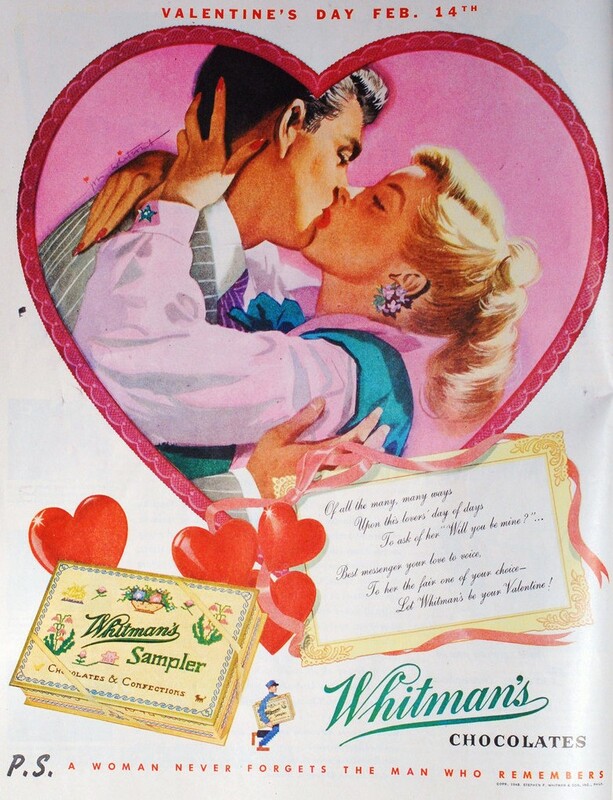 The Whitman’s Sampler box was released in 1912 and went on to become the best-selling box of chocolates in the US. Also a popular gift for Father’s Day, Mother’s Day and Christmas, the Sampler is a collection of the company’s favorite candies. It includes a “map” to make selection easy (in my house that meant no half-eaten pieces left for Dad!). The Sampler’s package design was inspired by a cross-stitched sampler hanging in then-president Walter Sharp’s home. The design has been reproduced ever since. 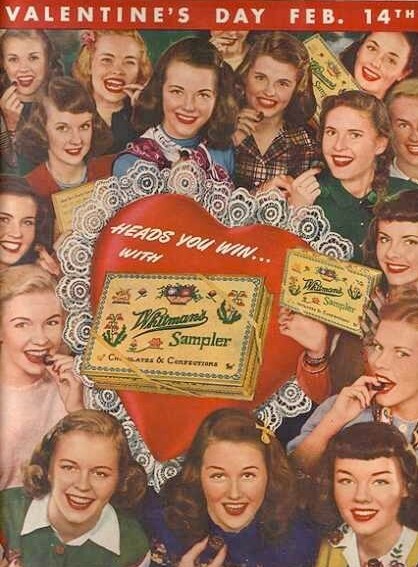 The Sampler was also the most advertised chocolate box, and print ads featured the works of top illustrators, photographers and celebrities. A-list pitchers included Humphrey Bogart, Elizabeth Taylor, John Wayne, Bob Hope and Jimmy Stewart. 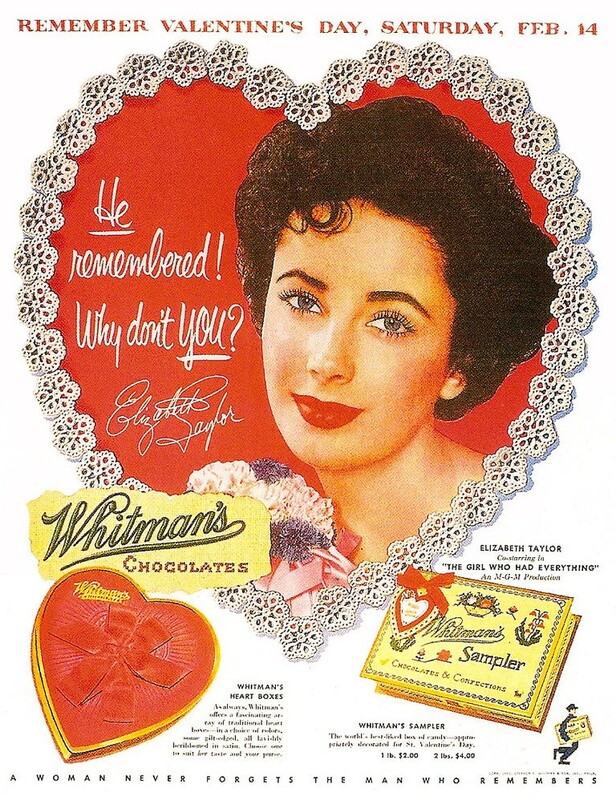 These classic ads were key in maintaining the brand’s top position in chocolate box sales. They’re also a great piece of our retro history as they showcase fantastic art and design, making many of them collectible.